The county of Meratt is Taldor in a microcosm: a once-glorious land left to decay by negligent nobles. But to help secure Princess Eutropia's bid for the throne, bold adventurers must now infiltrate her ancestral homeland and overthrow the corrupt Count Lotheed from within, gaining allies and solving problems left to fester far too long. Can they play idle noble by day and hero by night well enough to reverse the county's fortunes, or will the weight of history's sins be too crushing a burden? 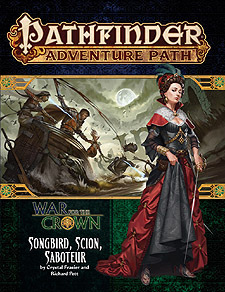 "Songbird, Scion, Saboteur," a Pathfinder adventure for 4th-level characters, by Crystal Frasier and Richard Pett. A gazetteer of the county of Meratt, a once-glorious country landscape rotting from within, by Amanda Hamon Kunz. A cult of personality subsystem so PCs can cultivate their public images and put their renown to work for their benefit, by Linda Zayas-Palmer. New rules for relics: magic items empowered by powerful historical events and improved by feeding their purpose, by Logan Bonner. A bestiary of monsters ranging from the spell-retrieving galluvix to the eyeball-plucking lamp blighter, by Tim Akers, Brian Duckwitz, Troy Lavallee, and Patchen Mortimer.